Thanks to the ZeroTrash ForHome® Dissipator Waste Disposer, food waste from the kitchen can be disposed of quickly, easily and environmentally. No more unpleasant odors from the dustbin or heavy trash bags to be transported to the box outside the home every day. 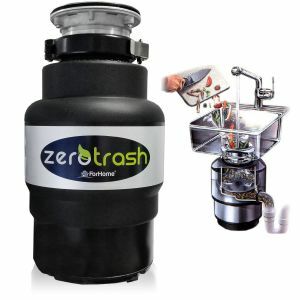 With ZeroTrash ForHome® it is possible to dispose of food waste directly into the kitchen sink, including chicken or fish bones, vegetables, fruit and vegetable peels and all the waste of organic waste that will be shredded into tiny parts that will be discharged with the sink drain water. The sink must have a 3.5 "drain hole (about 8.8cm). 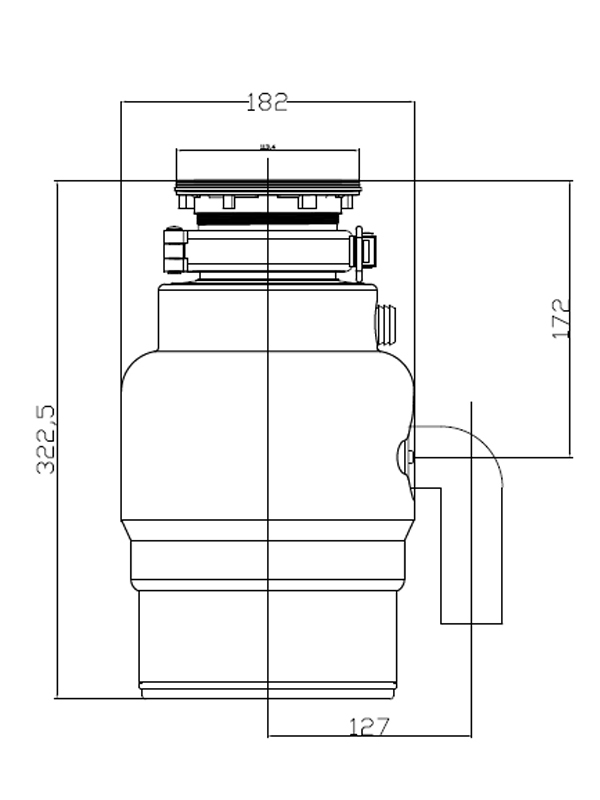 The waste shredder is equipped with a standard drain, for an installation on steel sinks, in the case in which the sink was made of thicker material than aluminum (like granite or marble) it is necessary to buy the adapter "elongated drain" separately "for thicker sinks (available among our accessories). 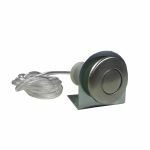 ZEROTRASH FORHOME® IS ALREADY PRE-ASSEMBLED, IT IS EQUIPPED WITH A QUICK CONNECTION WIRE AT THE 3.5 "STANDARD SINK AND A ALREADY INSTALLED PRESSURE SWITCH. POWER SUPPLY IN THE SOCKET AND 'ALREADY' READY TO ENTER INTO OPERATION! 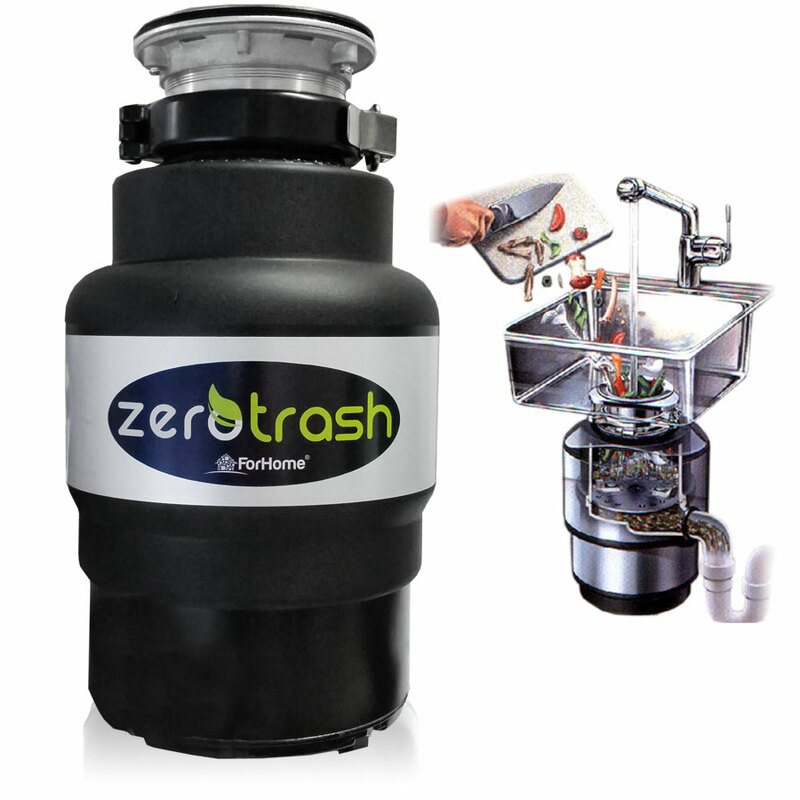 ZEROTRASH FORHOME® ALSO PROVIDES POSSIBILITY CONNECTED TO DISHWASHER DISHWASHER. The ZeroTrash ForHome® heatsink features screeds that can rotate 360 ​​° on the turntable. This solution is allowed by the particular shape of the shredding chamber. In addition, these screeds are full in shape on all models. These two features are very effective and make blockages extremely unlikely. 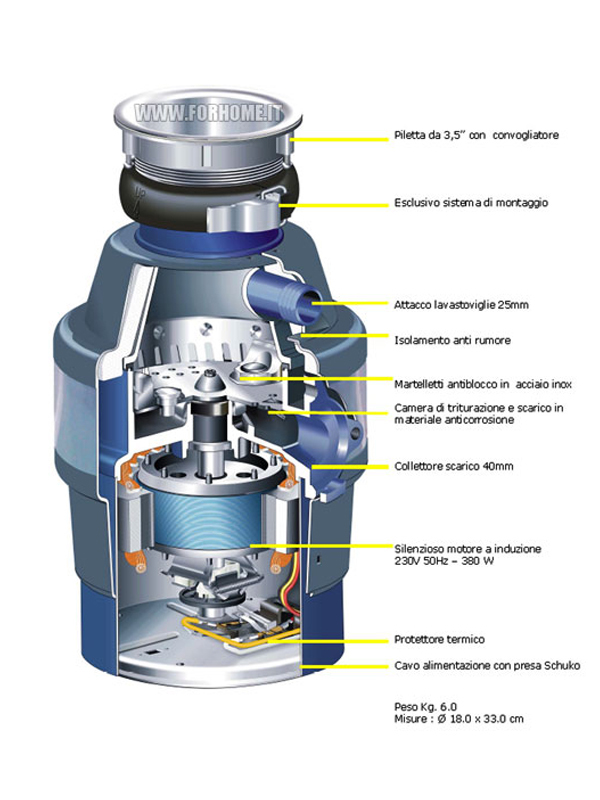 EQUIPPED WITH ANTI-BLOCK SYSTEM AND THERMAL PROTECTION OF OVERLOAD PROTECTION. Recall that the sink, of whatever brand they are, only dispose of domestic food waste, and do not go well for artichoke leaves, celery and other very fibrous waste, raw meat and raw chicken skin. Such waste could clog the drain. Proper installation and proper use will make you enjoy the benefits and convenience of your sink for a long time. Shredding chamber capacity: 1200 ml. Exhaust pipe: Ø 40 mm.